Multitude, Software Delay/Echo from Sinevibes. 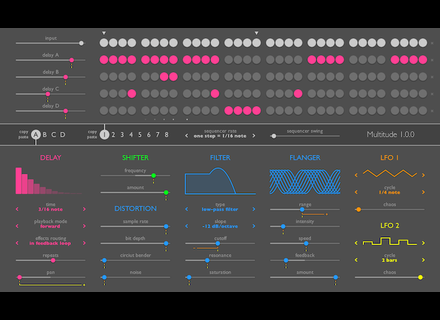 Multitude is a quad delay effect AU plug-in for Mac based on a gate sequencer. Multitude uses a gate sequencer to control the send of four separate delay lines plus the dry signal. This process allows for applying only a delay to a specific note, chord or audio part. Multitude is an AU plug-in for Mac OS X, it is available for $59 at www.sinevibes.com/multitude/. A new electric grand piano at Toontrack Toontrack launched today the EZkeys Electric Grand, a new virtual piano sampled on a Yamaha CP-80. Icebreaker Audio samples the Casio VL-Tone Sound designer Icebreaker Audio launched Calc-U Synth, a recreation of the Casion VL-Tone programmable calculator/synth for Kontakt 5. 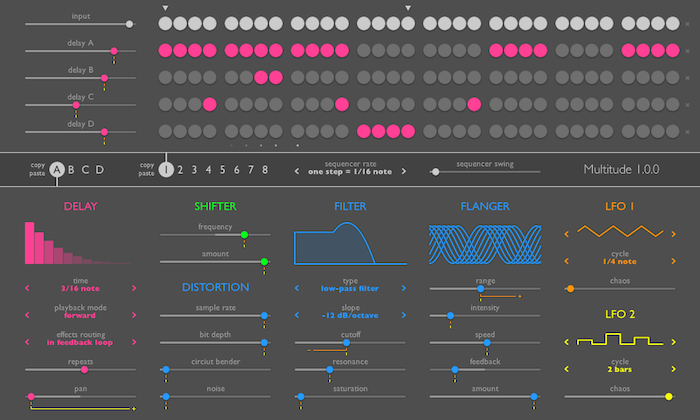 Native Instruments Komplete updated Native Instruments released a major update for its Komplete virtual instruments and effects bundles.